The other day I was skating back from the bay when I was struck by a Nature Euphoria — something that happens more often on Hawaii than perhaps any other place. A Nature Euphoria is when you experience something in nature that is so fascinating you must immediately stop what you are doing and just soak in the moment. 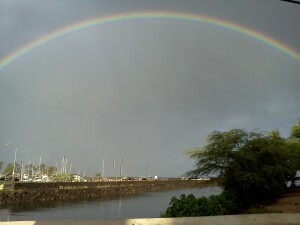 A full, double rainbow lit up an otherwise grey sky from one end of the bay, across the river mouth, to the other end of the boat harbor, brightening up the boats and greenery below. Just beautiful. Jodi was out stand up paddling with a group and (lucky ducks) said they got to paddle right into the rainbow. Living in the Rainbow State, we see rainbows all the time. There’s something about stand up paddling on the water with a rainbow up above that seems to put life’s troubles at bay.